When IDPA Headquarters released the provisional 2017 rules two changes sparked the most discussion. The one second per point scoring change and the addition of the Pistol Caliber Carbine (PCC) division. The first was expected, the second came out of nowhere. Sure PCCs are fun, but how do you say with a straight face that they are in keeping with the sport’s founding concepts? The fan-boys who wanted IDPA to adopt PCC so they can play with their toys twisted themselves into pretzels of logic trying to defend the new division. The critics, like myself, pointed to the poorly written rules, the inconsistency with the founding principals, the potential stage design issues. It also didn’t help that Wilson Combat just happened to be releasing their own brand new PCC, the AR-9. But that’s not to suggest that the PCC is a bad idea. Since the first lever action guns chambered in pistol calibers, the Pistol Caliber Carbine has had it’s uses. The longer barrel gives you better accuracy and velocity, and the reduced caliber is easier to shoot. Coupled with the AR-platform, the PCC can allow you to practice your rifle skills while shooting less expensive, more plentiful ammunition. As a ranch gun, a car gun, for home defense, or just for fun at the range, it’s easy to see why the pistol caliber carbine has it’s fans. But you don’t have to spend $2,000 to get in on the fun. 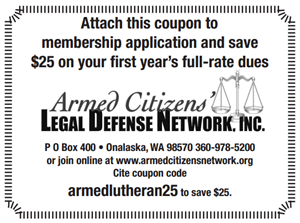 You can take the handgun you already own and convert it to a carbine for less than one-fourth the price. There’s a way to turn your Glock pistol into a carbine. No gun-smithing. No NFA paperwork. No tax stamp. No waiting. The RONI Civilian Pistol Carbine Conversion C-G2, made by CAA Industries Ltd., in Israel, easily converts your Glock 17 pistol into a carbine by swapping out your factory barrel for a 16-inch threaded barrel. The aluminum and polymer frame has a space-age look and it’s clearly well thought out in terms of features. The drop-in frame has a 10-inch flat-top rail and two five-inch rails for mounting optics, sights, lights or lasers. The frame includes a foldable foregrip but, if you’d prefer, it the grip can be removed, giving you access to third rail for mounting accessories. The collapsible stock has an adjustable cheek-piece, and the frame has multiple mounting points for a sling swivel. There’s even a place to store a spare magazine. The RONI C-G2 gives you a 16-inch carbine without having to learn a whole new manual of arms. It gives you the same grip angle and texture, the same trigger pull, the same magazine release as the handgun you use in competition of for home defense. That’s because inside it is the same handgun. 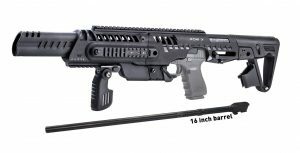 And at just over 3.5 pounds, the RONI gives you the performance of a carbine with half the weight of a purpose-built PCC. For right around $430 at GrabAGun.com, you could have a pistol caliber carbine and still have money for ammo, an optic, or extra magazines. Or all of the above. I’m looking forward to getting my hands on one and taking it to the range.